Welcome to Loka. All of our classes are open to all. No pre-registration is required for any classes, nor is any prior knowledge of yoga. We have many highly skilled and trained teachers, please let them know if you are new to yoga or returning after a long break, have any injuries, or are pregnant. It is our philosophy that yoga is learned by doing and so we urge you to jump right in and find the joy. That being said, try to have a sense of humor about it all and don't be hard on yourself or surprised to find that you don't know your left foot from your right foot or your ankle from your elbow. We all started in exactly that same place. Loka is a really sweet community and if you can ease up on judging yourself you'll find that no one else here is judging you, either, we're all concentrating on our own breath, poses, patience, and self-acceptance. Use your breath as your constant guide during class. If you cannot breath smoothly and comfortably through your nose in any pose, come down to child's pose. The teacher will notice if you're straining and turning red, and they'll appreciate your taking care of yourself. Our teachers do not demand obedience, we'd actually prefer if you were kind to your back, shoulders, neck, knees, and general psyches. IF SOMETHING HURTS, STOP WHAT YOU ARE DOING. IF IT FEELS WRONG FOR YOU, THERE'S A REALLY GOOD CHANCE THAT IT IS WRONG FOR YOU, AND YOU COULD INJURE YOURSELF SO PLEASE PLEASE PLEASE COME OUT OF THE POSE. Yoga-induced injuries are forbidden at Loka. Most teachers offer several pose variations, and there is generally time after class to ask specific questions if you did not find a comfortable alternative posture. The teacher might also have suggestions about other classes and teachers that you might enjoy. Yoga is not about turning us all into the same person, it's about developing and honoring your own unique heart, mind, body and soul. Teachers attempt to offer many levels of difficulty within a pose, but you are ultimately in charge of your own safety and comfort. Welcome to Loka and thank you for letting us be a part of your next journey. Say hello to the person on the mat next to you before or after class, Loka is an unusually friendly community and we'd like to welcome you personally. 1) Slowly lower yourself so that both knees are on your yoga mat a little wider than your hips (if you need more padding, place a folded blanket beneath your knees). Your shins should be flat on the mat with your feet behind you, soles facing the ceiling. 2) Sit on your heels. 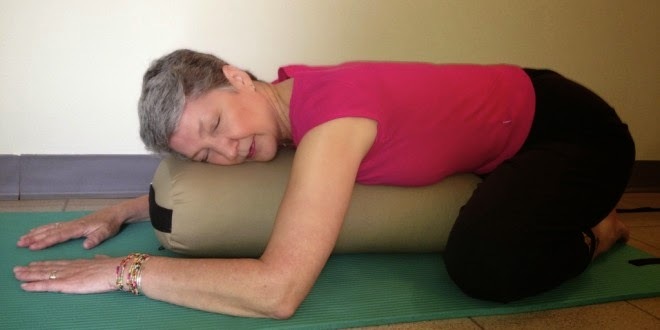 3) Place a bolster (pillow, couch cushion, or rolled blanket) lengthwise between your thighs; exhale and lay forward onto the bolster, turning your head sideways and let the bolster support the full weight of your head. 4) Allow your arms to relax to the ground, reaching forward a bit. 5) Close your eyes and focus on your breath. As humans, we breathe approximately 22,000 times each day. 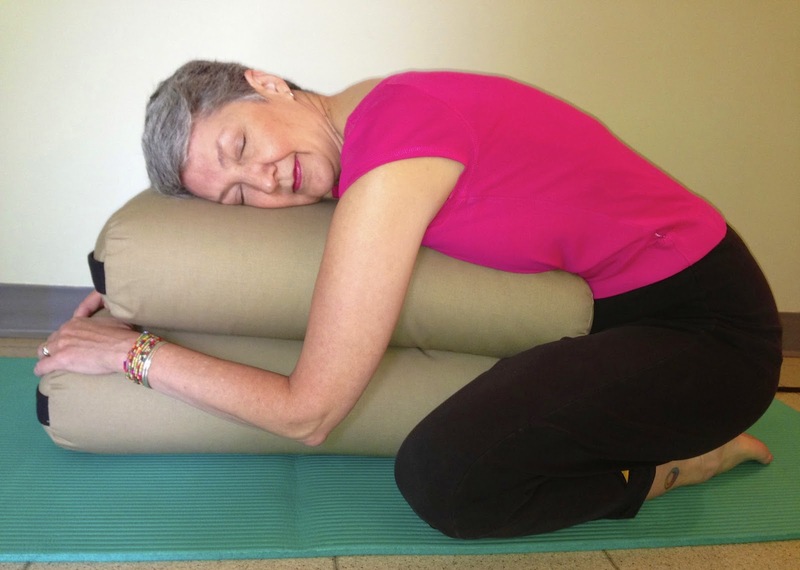 Allow this pose to help you find a deep connection with your breath. 6) If your feet or ankles are uncomfortable or cramp, roll a towel or small blanket and place it under your ankles. 7) Half way through the pose, turn your head the other way so that your neck receives an even stretch. *If you want more height in the forward bend, use two bolsters—stacked—one between your thighs, the other staggered toward you so it’s just under your belly (or more blankets and pillows).